When employees have regrets about accepting their current job, they are three times as likely to say they want to leave. 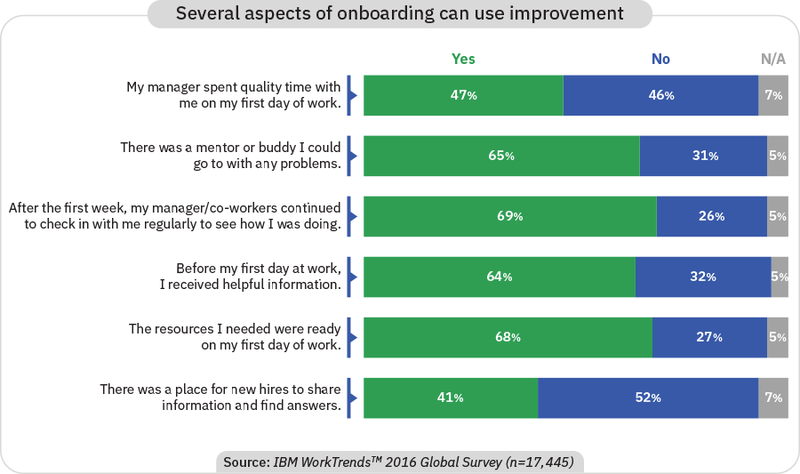 However, positive employee onboarding experiences could reduce those regrets, according to a global survey conducted by the IBM Smarter Workforce Institute. In fact, if they had a good onboarding experience, almost twice as many employees said they’re happy they accepted their current job. Given this link between onboarding and new hire happiness, organizations should critically examine ways to improve their onboarding practices. There are certainly some areas for improvement—less than half (47 percent) of our survey respondents said their manager spent quality time with them on their first day, and just 41 percent had access to an online community to find new hire information. Foster a sense of community among new hires. Managers should check in regularly during the early days and assign existing employees to be mentors. Put the right tools and resources in place. Make sure you have a way for new hires to share information prior to their start date and ensure you explain the tools and processes you have available to help them. Listen to new hires to understand their expectations and experiences. Our research found new hires are most happy about their decision to take a job when their onboarding experience is consistent with their expectations. Train managers on the importance of onboarding and the impact of their actions and inactions. When managers spend time with their new hires on the first day and throughout that first week, job regrets are much lower. Use technology to enhance the onboarding experience. An online community and onboarding technology can smooth the transition process. Learn how the IBM Kenexa Talent Acquisition Suite can help your new hires hit the ground running.